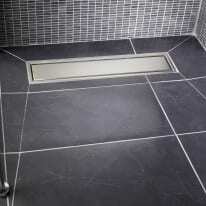 Design versatility comes with a two-in-one reversible waste cover which offers to stylish and contemporary options when fitting a tiled waste or stainless steel cover, a stainless steel grating option is available for an individual look. The different options of waste available mean the TriForm is suitable to use with tiles ranging from 6mm – 25mm giving much more freedom of choice the consumer and ultimately reduces labour costs. It is now possible to achieve everyday luxury in the bathroom with the help of AKW’s TriForm Linear former. The foundation of a beautiful bathroom, TriForm can drain even the most powerful showers quickly and efficiently, as well as accommodate a wide range of tiles. Easy to fit TriForm offers enhanced strength through its material composition, guaranteeing longevity and maintenance free installation. TriForm performs superbly and looks even better to create a truly aspirational bathroom experience.